The Federal Reserve meets September 25-26 to discuss next steps for monetary policy and interest rates. Firming inflation, strong growth, and low unemployment all point toward another increase in the federal funds rate. 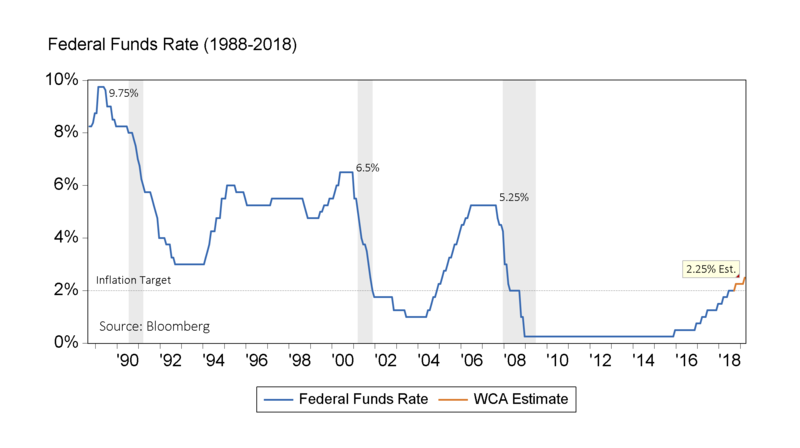 If the Federal Reserve does raise rates as expected, the federal funds rate will be at 2.25%, which will be above the central bank’s forecast inflation rate, but well below where rates peaked in past tightening cycles (chart, below). With short-rates equal to inflation, the “real” interest rate is no longer negative. How high the rate actually moves above the inflation rate ultimately depends on the Federal Reserve’s outlook for inflation and the economy, and their opinion of what the “natural” or “neutral” rate would be if the economy was in “balance.” In the past, it was thought that the “natural” short-term rate was about 2% above the inflation rate, but this assumption has been challenged since the financial crisis. Since then, many have assumed that the long-run “natural” rate would stay depressed indefinitely, but this assumption is becoming challenged as employment, wages, growth and inflation appear stronger than expected. When Jerome Powell holds his press conference on Wednesday, September 26th, we believe he will stay with the Federal Open Market Committee’s steady, gradual tightening story in response to what the data is telling him and the committee. We expect to see at least two more rate increases between now and spring of next year so long as trends persist. Continued gradual increases should further lift required returns on other short-term, high-quality fixed income assets above the forecast inflation rate — something savers have not seen in many years.